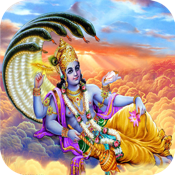 1) Shri Vishnu is the presever aspect of God, once in his shelter, he oversees preservation and optimization of every aspect of your life. 2) Shri Vishnu is the husband of Shri lakshmi (goddess of weatlh), in reality it is only upon inheritance of his nature in a person through his worship, that Shri Lakshmi can be made stable in anyones life or home. It is only through Vishnu that Lakshmi can be made stable. 3) Shri Vishnu is the Upholder of Satwa Guna (purity qualities) in universe, hence he provides fastest liberation to Satvik devotees.